Not long after New York's labor force returned from fighting in the South a building boom engulfed the Tribeca area as vintage homes and shops were replaced by tall loft buildings. Among the most prolific of the architects working in the area was Isaac F. Duckworth, who routinely made use of the increasingly popular cast iron facades. In 1866 he was hired by Emanuel Ehlfelder to design a five story structure on the site of a one-story brick building at No. 44 Lispenard Street. Ehlfelder had made his fortune as a merchant of "fancy goods and trimmings." He intended to continue his business at his Broadway address, erecting the Lispenard loft as an investment. Completed in 1867, Duckworth had turned to the relatively new French Second Empire style. Flat Corinthian pilasters separated the openings of the storefront, while the identical upper floors--each defined by prominent cornices--featured flat-arched openings with curved corners and paneled piers. The upmost, or terminal, cornice incorporated an arched pediment which announced "ERECTED 1866." Ehlfelder's new building filled with a variety of tenants. Among the first was M. Bleha, listed as "manufacturer and importer of artificial flowers, ostrich and fancy feathers." His listing in The Merchants' Directory in 1867 promised "Feathers cleaned and repaired equal to new." The first to be burglarized was Buchstein. Soon after he moved his operation into the building, on the night of July 8, 1867, thieves broke into his space making off with four pieces of cloth valued at $300--more than $5,000 today. Detectives quickly nabbed Charles Mayflower and Henry Schleabach who were found guilty and sentenced to four years and six month in the State Prison exactly one month later. At the time of the crime construction was nearing completion on No. 42 Lispenard, next door. Five months later, at around midnight on December 11, Police Office Kerns noticed a "suspicious individual" within the construction site. When Kerns moved in to investigate, he became the target of loose bricks. Officer McInerny, responding to Kerns's whistle, fired two shots at the trespasser, who jumped down 17 feet and tried to escape, but was immediately captured. Inside the uncompleted building the officers found bundles of silk and other goods from Despres, Hartley & Co., later valued at more than $25,500 in today's dollars. Inside No. 44 other goods had been packed up, ready for removal. The New York Herald identified the burglar as "a young Frenchman named Alphonse Deplechon and reported "It is supposed that Deplechon had some confederates in the burglary, but they managed to make their escape." In the meantime, S. Heineman & Co. seems to have been doing well. On July 9, 1868 it advertised "Wanted--A few first class operators on W. & W. [sewing] machines, accustomed to work on cloaks." And a year later it was again increasing its staff, promising "good pay and constant employment to competent hands." S. Heineman & Co. was the victim of crime in the fall of 1870; not by burglary but a slick 15-year old and an irresponsible mailman. Augustus Mockers offered to deliver some of letter carrier Thomas W. Parson's mail, including an envelope addressed to S. Heineman & Co. Instead, he opened the letters and removed anything of value, including the $16 draft (about $300 today) made out to Heineman & Co. The teen discovered that stealing from the mails was a bad idea when it was not S. Heineman & Co. who landed him in court, but Special Agent James W. Taylor of the Post-Office Department. At the same time another tenant was having problems. Wm. Maas & Co. dealt in novelties, and in the winter of 1870 had been "constantly missing small packages of goods" little by little for months. Simultaneously, two other novelty dealers in the immediate neighborhood were experiencing identical losses. Detective Field concocted a trap to discover the culprit. In February 1871 he hid in the store and waited. The New York Times reported that he "detected the charwoman, named Catharine Lehan, in the act of stealing a small quantity of cheap jewelry." She was arrested and in her rooms on Watts Street the detective found "a large quantity of miscellaneous goods which had been stolen from the stores in which she had been employed." By 1875 linen dealer and accessory maker Emil S. Levi was in the building. That year he interviewed potential workers in his office for his social club. An advertisement in The New York Herald on February 18 read "Wanted--A caterer (German) for a first class club, composed of over 230 members. Applicants call on S. Levi, 44 Lispendard st."
Levi's business was doing well enough that he needed a manager the following year. In June 1876 he was looking for "Forewoman on Ladies' Collars and Cuffs." He shared the building at the time with Isidor Rosenthal, woolens dealer, and Isidor Bloom, maker of ladies underwear. In 1878 Bloom's business failed and the courts named Joseph Biernoff its assignee. Within months he had formed Biernoff & Livingston with Lewis M. Livingston, at the same address. A want ad on August 8, 1879 suggests that they had turned the old firm around. "Wanted--Experienced hands on all kinds of ladies' underwear; study work." At the same time S. & G. Lorsch was in the building. The firm manufactured children's dresses and infants' robes. Dry goods and apparel firms would continue to call No. 44 home over the decades. In the 1885 Bischoff & Rodats, "embroidery material," moved its offices and salesroom here. Founded in 1835, its mills and factory were in Hamburg, Germany. New York's Great Industries called the firm in 1885 "a house of standard and in fact world-wide reputation." Leo Moses had been a traveling salesman for S. & M. Stern for two years at the time. His territory engulfed parts of New England and Canada. On October 21, 1889 he boarded the steamer Cumberland headed, according to Fur Trade Review, to Eastport, Maine. He never made it there. When the vessel arrived at St. John, New Brunswick the following day the 55-year old was found dead in his stateroom. Neither foul play nor suicide was suspected. Before boarding the Cumberland Moses had sent a letter to the office with orders and confirming he had received his pay in the mail. The esteem in which he was held by the firm was evidenced when Solomon Stern, senior partner, accompanied Moses's nephew to St. John's to recover the body. Berg Brothers Co. hired 14-year old Joseph Silver as an errand boy in 1890. His short-lived employment ended when he was fired in June that same year. It was not the last the firm would hear of the enterprising lad, however. As The New York Times worded it, "he had learned more than how to run errands." Within a week or two Berg Brothers Co. began receiving invoices from the Clark Spool Thread Company. On July 20 The Times reported "A watch was set and Silver came to grief when he presented an order apparently signed by Berg Brothers calling for $38 worth of goods. It is thought that he obtained fully $400 worth of goods before his scheme was discovered." Berg Brothers Co. and S. & M. Stern were joined in 1891 by Jacob Seligman, shirts, and I. Goodman, makers of "wrappers and tea gowns." The latter's operation was substantial, employing 52 workers, only five of which were men. Included in the work staff were 20 females under 21, two under 16, and one "child who cannot read or write English." They worked 10 hours per day, according to the State Factory inspector that year. Jacob Seligman's factory would remain in the building for more than a decade. Another clothing firm here at the turn of the century was Levin & Zutalove, run by Meyer Levin, Jefferson M. Levy and Bernard Zatulove. The trio provided what was apparently a most unpleasant working environment. In 1902 all three were individually cited for "failure to clean, disinfect and ventilate water closets." Surprisingly, Levy was a well-respected politician and former Congressman. He soon left Levin & Zutalove and partnered with former Mayer Smith Ely to form the National Novelty Clothing Co. The shirt-making firm also took space in No. 44 Lispenard. A change of name did not improve Levy's practices, however. In 1908 he was cited for "failure to provide water closet for female employees" and for "failure to ventilate and screen and keep in sanitary condition water closets at premises 44 Lispenard st."
Levy was persuaded to run for Congress again that year. The disgusting facilities in his factory became an issue. On August 9, 1908 The New York Times reported "In reference to the report that he had been arrested for violating the factory laws at 44 Lispenard Street, the headquarters of the National Novelty Clothing Company, ex-Congressman Jefferson M. Levy said yesterday that he was not the President of the company, but simply a part owner of the property." He told reporters that "alterations requested by the factory inspectors were being carried out." Presumably with improved restroom facilities, the National Novelty Clothing Co. was still in the building in 1910 when fire broke out on May 16. Berg Brothers Co. suffered $15,000 in damages and National Novelty Clothing and Epstein & Brother lost a combined $10,000. The total in damages would equal about about $665,000 today. Berg Brothers would stay at No. 44 at least through 1914. 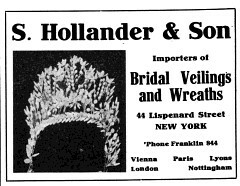 Following the fire it was joined by S. Hollander & Son, makers of children's wear and dealers in bridal accessories. About the time that Berg Brothers left the building, a far different type tenant moved in. Nicholas E. Marcoglou was a tobacco dealer and manufacture of Arabesca cigarettes. His packaging drew the legal ire of Junius Parker, another manufacturer, in 1915. Parker's letter to Marcoglou, dated September 1, complained in part of the "noticable, and, as we thought, unquestionable resemblance of these packages to our Pall Mall cigarettes." Despite the conflict, which ended up in court, Marcoglou remained in business at No. 44 at least through 1921. In 1920 two firms leased the building, the Efanef Fur Dyeing Co. and the Columbia Doll & Toy Co. Only a few months later Columbia Doll & Toy Co. purchased the property. The toy manufacturer leased space over the coming years to a mixed bag of tenants including the Signode System, Inc., which made strapping for textile bales and boxes; and the Grand Union Equipment Company, dealers in soft goods. Like so many of its predecessors in the building, Grand Union Equipment Company was the victim of extensive theft beginning in 1930. Over a period of years inventory mysteriously disappeared. Then, in October 1934, the firm's president, Samuel Sackett, dropped into Frank J. Wolfram's engraving shop next door at No. 46. He happened to notice towels bearing his label there. He notified police who obtained a search warrant for Wolfram's furnished room at No. 135 East 104th Street. Not only did they check Wolfram's, but all 95 of the rooms in that building. After a five-hour search, they determined that "virtually all of the furnishings in the house" had been stolen from the Grand Union Equipment Company," according to The New York Times on October 30. Wolfram had hired burglars to make off with an estimated $20,000 in goods over the years. The value of the haul would equal about $366,000 today. Even as the garment district moved north of 34th Street there was at least one hanger-on on No. 44. Lichiman & Son Mfg. Co., makers of children's wear, was here in the early 1940's. When the building was sold to the newly-formed 44 Lispenard Street Corporation in October 1942, The New York Times reported that the building would "be altered by the buyers for their general merchandise business." Throughout the decades of varying use, the cast iron facade remained essentially unaltered. In the mid-1990's two art galleries--Thicket and Kurt Mundahl--moved in, signifying the arrival of the Tribeca rebirth. A renovation completed in 2018 resulted in one loft residence on the second floor and a sprawling triplex above. That 3,000 square foot residence was offered for sale in 2018 for $7.05 million.